Click here to return to standard rates and packages. Two nights in a designer room. Sunset champagne sail in the Whitsunday Islands. 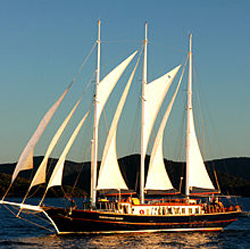 or instead of the massage and sunset sail enjoy the exhiliration of a fun maxi day sail. Five nights in a designer room. Enjoy a glass of champagne during your sunset sail in the Whitsundays. We can change, extend, add and delete parts of these packages to suit your requirements itinerary and budget, we are here to help, please ask. These packages are based on double/twin share - single only an additional $45.00 per night. With my passion for sailing, I sailed from England into the Whitsundays 20 years ago. "With my local knowledge I will book you on the 'Best Quality and Value Boat' in the Whitsundays" - John Sergeant. "You need experienced crews, safe reliable boats, personal service and the best food." 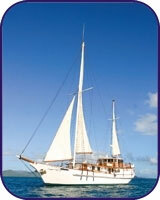 We "Guarantee" we will make your 'Whitsunday Islands' experience the most outstanding highlight of your holiday. We want you to appreciate the beauty of this place as much as we do and are ready to share this knowledge with you. * 50% Deposit is required to confirm a booking, with the balance of accommodation collected on the day of arrival. * Any other charges incurred during the guests' stay are to be paid on the day prior to departure. * $25.00 Cancellation Fee is charged on cancellations made more than 7 days prior to 6pm on the day of arrival.